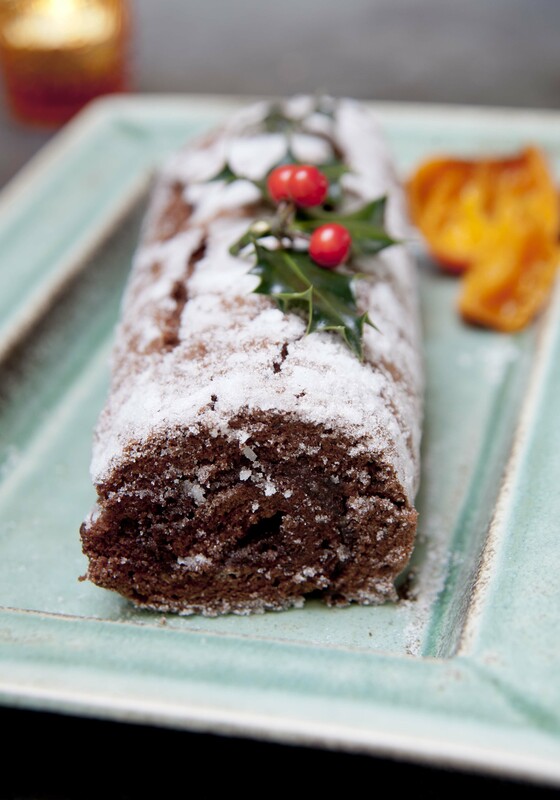 I have very fond memories of my late Mum’s chocolate roll cake so will be giving this recipe a try this year. Preheat your oven to 200⁰C/400⁰F/Gas Mark 6. Grease a Swiss roll tin, then line it with baking parchment. In a large bowl, whisk the sugar, happy eggs and happy egg yolks together until thick and creamy. Add the flour and cocoa powder and carefully fold into the mixture, trying to retain as much air as possible. Pour the mixture carefully into the Swiss roll tin, ensuring an even cover. Bake for 10-12 minutes until springy to the touch. Take a large sheet of baking parchment, dust it with caster sugar and orange zest, then turn the sponge out onto it. Trim the edges with a knife. Roll the sponge from one end leaving the paper in the middle. Cool on a wire rack. Whisk the happy egg whites and caster sugar until they form soft peaks i.e. when you make a peak, the tips droop. Break the chocolate into pieces and place in a plastic bowl with the butter. Heat in a microwave for 30 seconds, leave for 20 seconds and then beat with a whisk. If the chocolate is not completely melted, heat in the microwave for 10 second bursts until the chocolate is just melted. Mat’s top tip: mix the chocolate between each burst to ensure even heating. Add 1/3 of the beaten happy egg whites to the chocolate and combine using an electric beater. Do this quickly; the chocolate will begin to set and form hard lumps, so don’t worry about retaining the air in the mixture. Now combine the other 2/3 of the happy egg whites by gently folding with a spoon until the mixture is a smooth consistency. Place the whole mixture in the fridge to set. Clean the kumquats and pick off any stems. Place in a saucepan with the water and icing sugar. Bring to a simmer, then turn down to just below simmering point i.e. small bubbles form on the sides of the saucepan. Cover the water with a circle of baking paper to keep the kumquats submerged. A good way to do this is to use a large piece of baking parchment and a saucepan lid which is just too small for your pan, then they will both sit happily on the surface of the water. Heat for 2 hours. Remove the kumquats and put to one side to cool. Bring the sugar liquor up to a rolling boil until it has reduced by 2/3. Taste, then enhance the flavour if required by adding lemon or orange juice to make a lovely citrus sauce. Unroll the sponge and remove the baking parchment. Spread the chocolate filling over the surface of the sponge to about ¼ inch thick, then place the kumquats at even distances across it. Roll the cake up. Serve in slices with a drizzle of citrus sauce.